Life has been good. A bit sleep deprived and cranky, but really good. I feel like our transition to four children hasn't been as bad as I thought it would be. But then again I think that is because I have lowered my expectations. I remember when Rose was born my motto was, "Success is only having one person crying at a time, with bonus points if it isn't me." I realized the other day when Tabitha was screaming because she was hungry, Abe was screaming because he couldn't hold the baby, I was screaming because I was overwhelmed, and Rose was screaming because-- well, actually I don't know why she was screaming--- that my NEW motto is now, "Success is only having TWO people crying at a time, with bonus points if one of those people isn't me." It helps not to set my expectations very high. Which means if you happen to come to my house in the next six months, please ignore the oatmeal on the couch, the muddy footprints on the stairs, and the weeks worth of dishes in the sink. I'll get to them eventually. Our goat grew a goatee! Which I guess is why they call them "goat"ees. His voice also changed. His "naaaa" is much lower now than it use to be. He also seems to be a bit more aggressive-- butting heads and such-- with Solomon the boy sheep. I guess this means he has reached puberty. We should probably get him a girlfriend. I never got to post about Rose's birthday, which was more than a month ago, and I really wanted to share about her day. 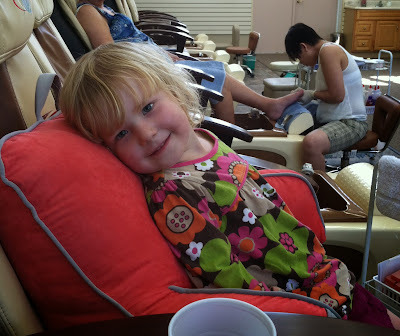 I think the highlight of her birthday, for her and for me, was that we went to go get pedicures together. When we went to Utah for my brother-in-law's wedding I got a pedicure because I figured that, since the only shoes I could fit my swollen feet into were flip-flops, I should at least have cute toes. Rose was jealous and so I promised her I would take her for her birthday. We went during Jon's lunch hour and so it was just her and I. They didn't have a chair small enough for her so they had to prop her up with big pillows to get her feet to touch the water. 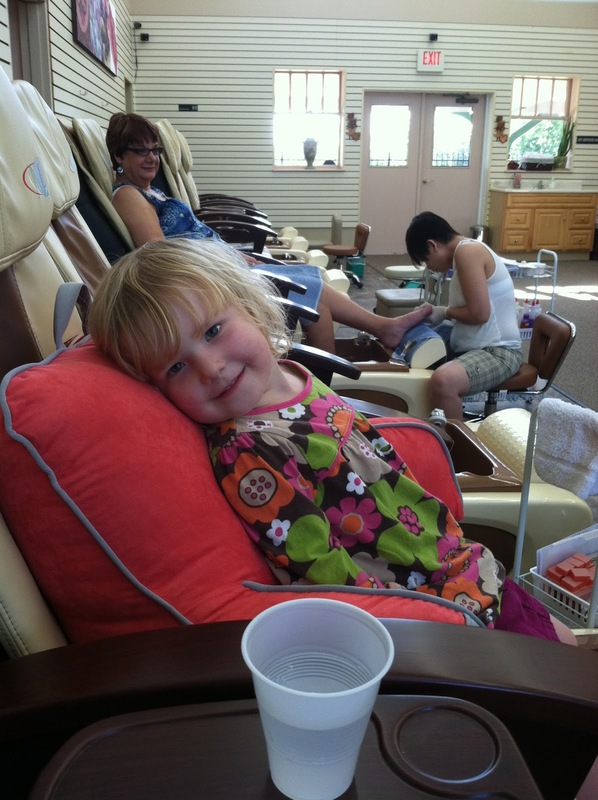 I don't think they are use to four-year-olds and so she got lots of attention from the ladies at the salon. Jon snapped this picture of us as we were coming back. He said that Rose was just beaming. Oh, my poor feet. It hurts just remembering! I've decided that for each of our kid's birthdays I am going to focus less on giving them toys or gifts but focus on giving them experiences and time. Toys and books will get broken and thrown away, but time together is something that they will always remember. For Rose's cake I made her a ballet slipper cake. Our library checks out cake pans. Isn't that the best idea? They have a huge assortment of different specialty cake pans you can choose from. 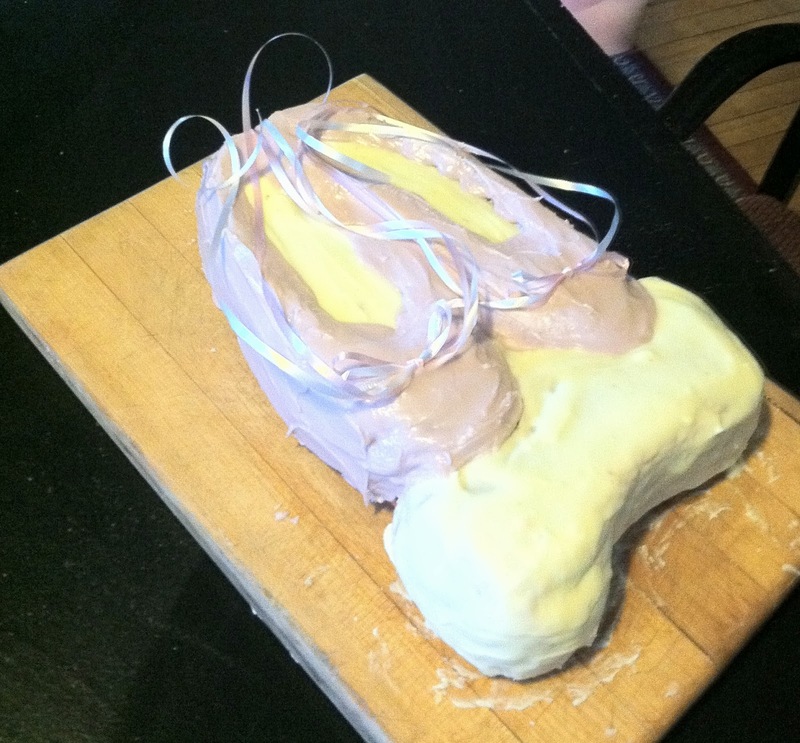 When Rose picked out the ballet slipper cake pan I was a bit worried about how it would turn out. I've never had much luck with making cakes and frosting, but I think it turned out cute... if I do say so myself. 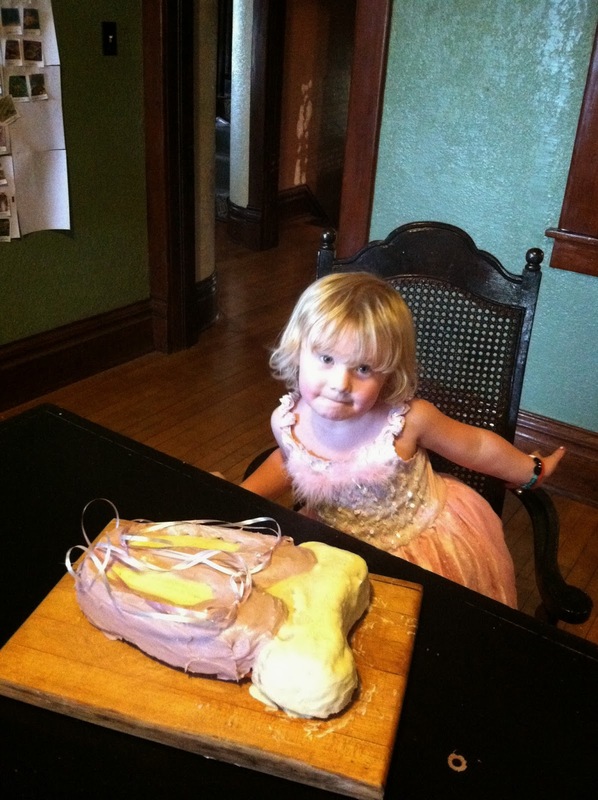 And of course if you have a ballet slipper cake you have to wear your ballet dress to eat it in. Then she got spoiled with presents from grandparents and aunts and uncles. I think getting so many packages in the mail was half the fun of it! Abe caught his first chicken! I have never seen a kid so proud of himself. This is pretty much a rite-of-passage at our house. Granted, we didn't know that this chicken was sick and actually, it died the next day, but it gave him confidence. Now he is a chicken catching machine. Much to his delight and the dismay of our chickens. It is amazing, now that I am no longer pregnant, how my creative juices are flowing again. For the last few months of pregnancy I was just so tired that all I wanted to do in the evenings was to lay in bed and watch movies or read a book. Which is what I did. It was like pulling teeth to try to write anything. I guess my body was channeling all its creative power to create another person... which is pretty awesome. But wow, now that she is here I feel this surge of creative juices flowing again. My brain feels like it is going to burst with ideas I want to write about. The only hard part is finding the time to do it. It seems like whenever I sit down to write someone needs me. But my head might explode soon if I don't get some of these ideas out of it. So hopefully I'll figure out how to carve out the time. We have been slowly getting back into homeschool things. Mostly we read lots of books, watch Planet Earth, and play Reading Eggs. But I am slowly gaining the organization-- and the energy-- to do more. This week we had a field trip with our homeschool program to the most amazing orchard. They had so many fun things to do, but the best part was that they had a corn pool. It was two feet of corn and it was amazing! When I was younger my sister and I fantasized about winning the lottery and then getting it all in pennies. We wanted to have a penny bath and be covered in pennies up to our shoulders. Well, this came pretty close to that. Abe tried to swim in it. Do they do these anywhere else? Or is this just a cooky we-love-corn-Iowan-thing? Have a wonderful weekend and a beautiful sabbath! I loved your motto!! I will use that. :) I have four kids as well. ages 18 months, 3, 5 and 7. While you are breastfeeding or cooking etc. Great idea to use a recorder! I will try that. 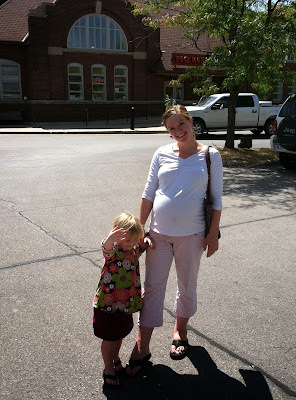 I love Five Things for Friday. Miss you!